Harvey Houghton married Sivina Fuller. Sivina Fuller married Harvey Houghton, son of Rufus Houghton and Eunice Houghton. William Whitmarsh married Annah Houghton, daughter of Calvin Houghton and Annah (? ), in Sep 20, 1841 at Stow, Middlesex Co., MA, USA, Anna, Sept. 16. Annah Houghton married William Whitmarsh in Sep 20, 1841 at Stow, Middlesex Co., MA, USA, Anna, Sept. 16. Benjamin Muzzy and Mary Houghton declared their intentions of marriage on Feb 17, 1753 Stow, Middlesex Co., MA, USA. Mary Houghton and Benjamin Muzzy declared their intentions of marriage on Feb 17, 1753 Stow, Middlesex Co., MA, USA. Martha J. Henry married Obed Houghton, son of Jabez Houghton and Rebecca Smith, in Jul 11, 1844 at Stow, Middlesex Co., MA, USA, a teamster, of Harvard and son of Jabez, a. 27; she, age 19. Calvin Houghton married Annah (?) cjv. Annah (?) married Calvin Houghton cjv. John Wright married Deliverance Ross in Sep 26, 1781 at Shrewsbury, Worcester Co., MA, USA. Lucy Houghton and Alonzo Ferrin declared their intentions of marriage on Sep 22, 1849 Shrewsbury, Worcester Co., MA, USA. Alonzo Ferrin and Lucy Houghton declared their intentions of marriage on Sep 22, 1849 Shrewsbury, Worcester Co., MA, USA. 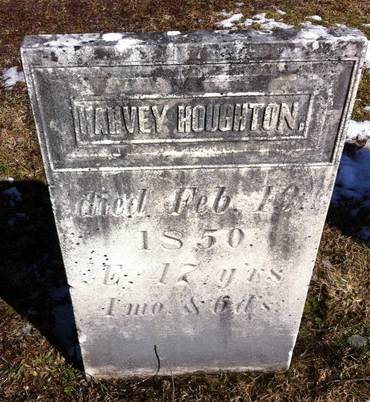 Sally Amsden married Jesse Knight Houghton, son of Phinehas Houghton and Sarah Knight, in Mar 22, 1825 at Southborough, Worcester Co., MA, USA. Mary L. Houghton married Hiram Mellen in Apr 15, 1849 at Shrewsbury, Worcester Co., MA, USA.